If you know of a Hispanic Nashvillian who has participated in StoryCorps or plans to participate, please send a story tip to the editor. This fall, the Nashville Public Library became only the second institution in the nation to host a "StoryBooth," an outpost of StoryCorps, the award-winning national project that encourages Americans to listen to each other by sharing the stories of their lives in sound. Select interviews gathered at StoryBooths — small freestanding recording studios placed in public spaces across the country — are broadcast on National Public Radio (NPR). The interviews also added to the StoryCorps archive at American Folklife Center (AFC) at the Library of Congress in Washington, D.C., building an oral history of America. There is a specific community outreach effort named The Griot Initiative, for example, to capture the stories of African-Americans. The Nashville StoryBooth is located in the Nashville Room on the second floor of the downtown Main Library, 615 Church St. The public can make interview reservations by visiting storycorps.net or calling 862-5800. 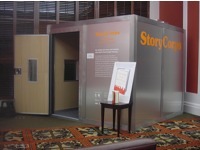 The StoryCorps StoryBooth will be in Nashville until September 2008.